Ah, early May. That time of year when other sports are winding down -- hockey, basketball, competitive data entry -- and baseball is all the local sports writers and radio hosts have to talk about. The NFL draft is old news, the Pistons and Red Wings are done for the season, so ... how about them Tigers? I guess? For some reason, this discussion is almost never happy. It's almost never positive. It's as if people want to be upset with their baseball team and feel happiest after they've identified all the perceived red flags. Real talk: it's a sport. It's not dentistry, or a neuroscience, or even an art form. It's pure entertainment, and if it's not something you enjoy, quit watching it. Simple! You'll be happier! So will all the people you've been needling with your doomsday gloom! Everybody wins! Here's an example: local media personality (sorry, no names, no links, it's not worth it) asserts that the problem with Justin Verlander is obvious. No head-scratcher here, friend, it's plain as day. It's his velocity. This media personality even lends some air of legitimacy to his findings by using PITCHf/x data! But that's as far as the critical thinking goes. Verlander's fastball is down (92.4 MPH), his slider is down (84 MPH), and his curveball is down (76.7 MPH), so bing-bang-boom! that's yer problem, right 'dere, ayup. Let's go ahead and take that to the next step in the reasoning process, though, and see what happens. Ahem! Oh, Magic Computer? Run a search for me. Well I'll be damned. Every single one of these guys throws a Verlander-speed fastball (Kershaw and deGrom are faster by 0.1 MPH). Only Kershaw and deGrom have faster sliders (closer to 87 MPH). Only King Felix has a faster curveball (78.8 MPH). How's Masahiro Tanaka doing this season, anyway? Oh, a 2.87 ERA with a 0.957 WHIP, a 2.78 FIP, and eight strikeouts per nine innings. And Johnny Cueto, how's he doing? Ah, I see, a 3.61 ERA with a 1.134 WHIP, a 2.31 FIP, and striking out almost a batter per inning. Got it. I'm beginning to think maybe velocity is really more of a secondary issue. Maybe the ancient gurus were right when they said "yea, verily, if thou wouldst succeed, get thy secondary pitches under control, and for the love of Henry, locatest thine pitches with more precision." If you had to bet on one of Verlander, Anibal Sanchez, or Mike Pelfrey bouncing back and finding a sweet groove before June 15, I'd bet on the former Cy Young winner who was just dominating hitters last season. Remember those last 14 starts? When hitters were slashing a pathetic .207/.249/.299 against him? When his ERA in that span was 2.27? Remember that, way back a thousand years ago, when he was young, in the late fall of last year? 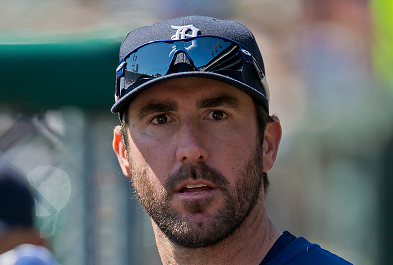 Let's revisit the Verlander question again in July. But not a moment before.